After school program, 2 and 4 week summer camps. 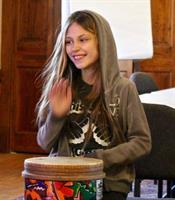 MUSICA FRANKLIN offers free music instruction for low-income elementary school-age children in Franklin County. There are no fees, auditions, or other barriers to participation. 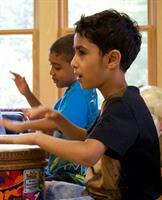 In our after-school programs and summer camp, children learn percussion, violin, choral singing, and movement. Current research shows music education positively affects brain development and improves academic performance and social and professional skills, and as they study music, our students are also learning discipline, responsibility, standards of excellence, the ability to collaborate toward a common goal, and community engagement. .
Musica Franklin is inspired by El Sistema, a music and social change program that was started in Venezuela 40 years ago and is now practiced all over the world, transforming the lives of students, their families, and their communities. We are a 501(c)3 nonprofit organization.